Beaches aren’t what most outsiders think of when they picture Texas, but we’ve got 600 miles of Gulf coastline that say otherwise. Loading up the car with coolers, jamming a great playlist, and road trippin’ to the coast is a major part of the beauty of living in this great state, and we’re lucky enough to have multiple beautiful beaches just a couple of hours away from most of our major cities -- including a couple beaches you can legally drink on. It’s not all sippin’ tiki drinks by the seashore, either. Our incredible natural resources lend themselves to some of the best fishing and birdwatching in the world, along with kayaking, kiteboarding, wake surfing, and camping. 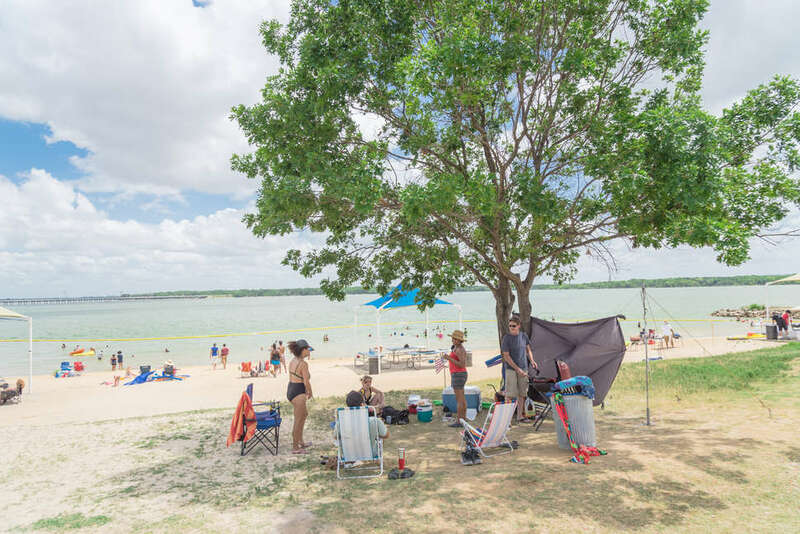 We’ve highlighted Texas’ finest shorelines below, along with the best places to eat and drink (or, for less developed areas, the best things to do). Whether you’re cramming the fam into a minivan or gathering your buds for a spontaneous sandscursion, these are the Texas beaches you want to set your sights on. South Padre may be ground zero for wild Spring Break antics in March, but the rest of the year is much more reasonable. Spend the day fishing with one of the many guides, or find Flipper on a Dolphin Watch. Head to Isla Blanca Park for family-friendly fishing, concessions and facilities, or drive up to the north part of the island for a more sparsely populated stretch of sand. And if you want to be in the thick of the hot beach action, post up in front of Wanna Wanna Beach Bar and order yourself a turbo pina colada -- or just BYOB, because that’s fair game on SPI. Where to eat/drink: Grab a cold one at Clayton’s for live music and a lively (if overpriced/overpopulated) scene, or cool down with a tropical cocktail at Coconuts on the bay side. Build your own fresh ceviche at the aptly named Ceviche Ceviche, carbo load at Gabriella’s, or dig into of the best fried shrimp you’ll ever have at Dirty Als. Louie’s and Tequila Sunset dominate the nightlife, and if you’re a late-nighter, head to Coral Reef for cigarette-smoke-infused karaoke. For families, walk the proverbial plank into Pirate’s Landing, and learn about why plastic straws are banned at the Sea Turtle Rescue Center. Those in the know are already well acquainted with San José; called St. Jo’s by locals, this 21-mile-long, privately owned island is accessible only by the Jetty Boat (tickets are $12). There are no cars allowed here, so you’re guaranteed a fume-free experience on some pretty, unspoiled beaches. The bird watching, jetty fishing, and seashell game are what set this beach apart from some other more populous spots, but with no services to speak of (including water, port-a-potties, shade, or habitation in general), you’ll want to be prepared, boy-scout style: packed coolers, umbrellas, and a willingness to pee in the ocean are essential. Where to eat/drink: It’s all BYO on the beach, but you can find some great food and drink in Port Aransas. If all that beachin’ has made you hungry, indulge in a major lunch at MacDaddy’s Family Kitchen. Their MacDaddy Burger (fried onions, fried jalapenos and added brisket, for good measure) is a crowd favorite. Channel the Caribbean at Irie’s Island Food, a little spot rockin’ fusion food. Sports fans will appreciate the big screens, Bloody Mary bar and 20 taps at Stingray’s Taphouse and if you’re looking for some late night and live tunes, Giggity’s is the go-to. 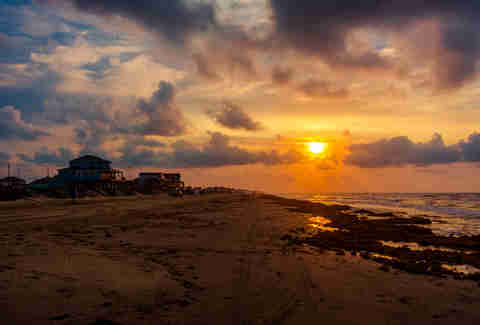 Devastated by Hurricane Harvey, this little beach town has battled back in the months since, working overtime to fix their infrastructure -- so reward that commitment with your tourism dollars! Come here for a weekend on the beach that’s been rebuilt with public palapas, restrooms, and showers. Because it remains shallow, this is a great spot for people with children looking for shells and hermit crabs, who don’t want to get pummeled by waves. There’s a nearby pier for fishing, and while the cost for parking is $5, there are no cars allowed on the beach, so it’s a price you’ll have to pay. What to do: Outside of its beach access, Rockport is a cool little town with movies in the park, a Summer Sand Dollar Market, and tons of community activities. Enjoy a little island music and some oysters at Paradise Key, pick up a pie at Panjos Pizza, grab a burger from Steerburger Grill, and treat yo’self to some frozen yogurt at Pink Octopus. For a fancy cocktail, stop in at Glow (social hour 4:30pm-6:30pm), or try your luck at local dive bar Legends for karaoke, bar games, and some dancing. 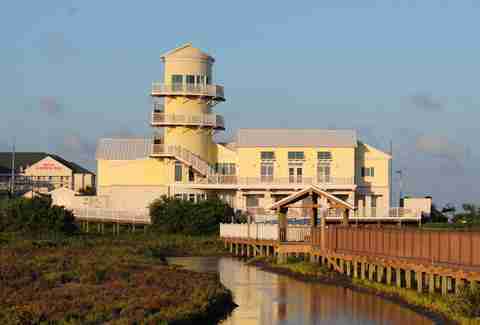 Escape the clamor and clutter of Galveston’s shore by heading to Crystal Beach on the Bolivar Peninsula. You’ll have to jump through some extra hoops -- namely catching a ferry and picking up a parking pass for $10 -- but it’s a small price to pay for the relative peace and quiet you’ll enjoy once you’re digging in the soft sand, searching for shells, or spending the day splashing in the waves. Overnight camping is also allowed, though the facilities (as you might expect) are sparse -- some portable restrooms and picnic tables are all you get. For a more lively weekend, catch the Annual Texas Crab Festival with music, art, and all manner of crabby creations. Where to eat/drink: Take a break from the sun and stop by Steve’s Landing for swingy chairs and sunset views, or take at least one run at Stingaree’s legendary Mermaid Koolaid and barbecued crabs. Be prepared to don a bigger bathing suit before eating The Shipwreck at Fantasea: this beast is a bacon cheeseburger with grilled cheese sandwiches as buns, topped with an onion ring. For a local-heavy experience, the Ship’s Wheel is the windowless dive bar of your dreams. As the world’s longest undeveloped barrier island, Padre Island National Seashore (PINS) is the perfect place for a beach adventure. Sure, you can (and should) laze about by the water, but it’s also an awesome educational opportunity you shouldn’t miss. Stop by the Malaquite Visitor Center for information, and to pay the entrance fee: $10 per car or $5 for individuals. If you’re doing any major exploring, you’re likely going to want a four-wheel drive vehicle as parts of this beach are more “wild beach” than boardwalk. What to do: There’s no shortage of communing with nature to be done here. PINS has exceptional birdwatching during early spring, fall and winter when thousands of birds migrate through the park. Plan your trip from mid-June to August, and you might be lucky enough to see a sea turtle hatchling release. But wait! There's more! You can also camp overnight in a tent or RV, surf-fish for "the big one" right off the beach, and do some serious off-roading on the sky-high dunes. 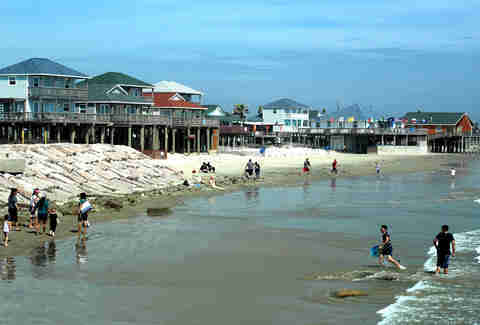 Within driving distance from Houston (just down the Bluewater Highway), Surfside has a reputation for being one of the cleanest beaches with the clearest water in Texas. Sure, it can be crowded on weekends like everywhere else, but head a little further up the beach access roads and you’ll find a bit of extra space. Wade-fisherfolk benefit from the unusual depth of the waters offshore, and the jetties provide a natural opportunity to catch ling, bonita, and kingfish. 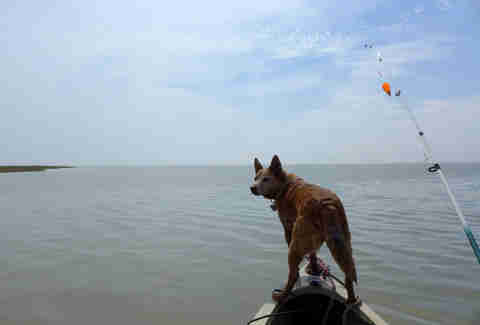 For non-fisherfolk, walk down said jetties to bird-watch and boat-watch. At certain times of year (hurricane season, e.g. ), this beach is a haven for surfers looking for the next big wave -- but you already knew that from the name, right? Where to eat and drink: Tiki drinks and beachfront views (plus American fare) draw people to the Seahorse Bar and Grill; for swanky-ish seafood, the Red Snapper Inn is a go-to for visitors and locals. You can expect a wait for both spots on busy weekends, though. Drive a little further into Freeport for barbecue at Sista White’s, boiled crabs, and boudain at Capt. Ken’s Port O Call, and crawfish at La Sirenita. For something quick, grab a snack at the Jetty Shack: they serve beer, wine, and booze setups along with a tasty burger (plus they’re vegan-friendly!). 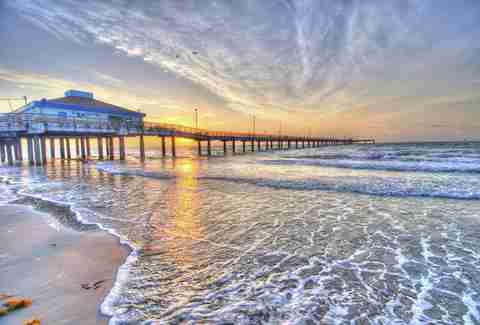 Arguably the most popular beach alongside SPI, Port Aransas is a family-vacation hotspot where you can easily rent houses right along the beach and walk the few feet down to sandy shores. Yes, Hurricane Harvey did a number on the shore here as well, but locals are quick to remind you that Port Aransas is open for business. There are beach showers and bathrooms available for the all-day types, and the beach remains relatively clean as it’s maintained by the city. This is your quintessential beach day with lots of kiddos, tents, chairs, and other people’s music; if you’re looking for more peace and nature, head south to Mustang Island’s official Texas State Park with primitive beach camping, pristine beaches, and a lot less foot traffic. 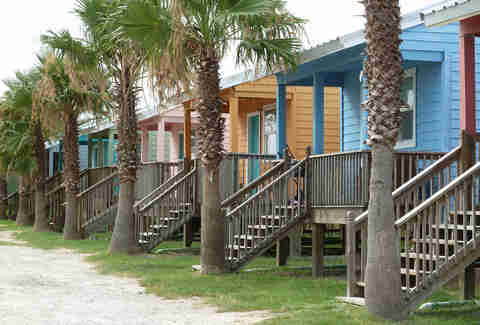 What to do: Port Aransas has yearly events that are almost as much of a draw as the beach. 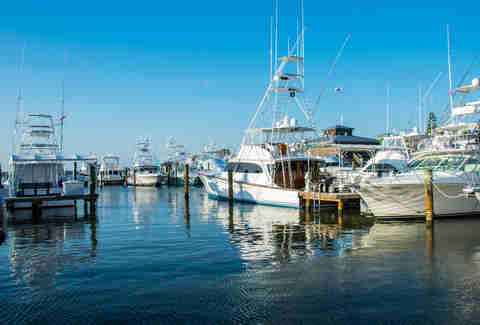 For fishing, enter the Deep Sea Roundup; music and art lovers should come to the annual Art Fiesta Weekend; the Harvest Moon Regatta is the largest point-to-point sailboat race in the US. Texas Sandfest celebrates sand sculptures and there’s even a Whooping Crane festival for you bird nerds. And fans of the weird, drop into The Gaff Bar for their famous belt sander races. Don’t ask -- just go. 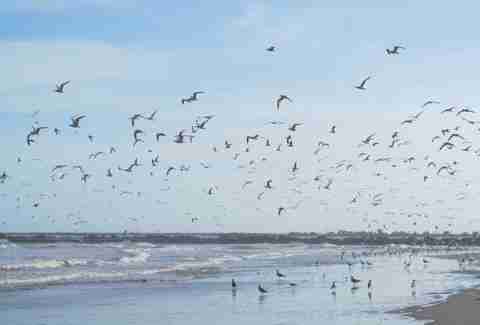 Founded as a way to promote education and the preservation of the wetlands, Matagorda Bay Nature Park is a two-fer: you have the beauty of the bay and the wildlife there, as well as the option to sink your feet into the sand. Work up a sweat on one of the many hiking and walking trails, drop a line in the water off one of the three fishing piers, or take to the water in a rented kayak. There’s also a 70-site RV park on the property for those who eschew tent camping. Where to eat and drink: Though there aren’t a ton of options here, you’ll find some darn good coffee about 6 miles outside the nature preserve at Cattails. For lunch and dinner, Spoonbill’s is serving seafood (obviously) and steak that’s definitely a step above whatever you’re whipping up in an RV. For southern-fried goodness, your options are local hot spot Snappers Bar and Grill and Poco Playa, whose attractions include a game room and live entertainment on the weekends. Kelly Stocker wasn't born in Austin, but she got here as fast as she could. If you want to follow her adventures around town, find her on Twitter and Instagram.